Quality management at Suntech includes all relevant processes. 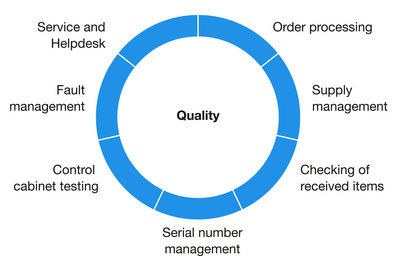 From order processing to service, quality guidelines are in effect that guarantee the best quality possible. The Suntech quality concept connects all processes that influence the quality of the product. Automated testing equipment has been developed and applied to series control cabinets. Testing documents are a part of the switch gear delivery.